Congratulations to Robert Berry, Darren Bradford & Mike Chapa of Ship It! They are your 2018 Fall AZPL State Champions!!!! The 3rd annual Globe Trot is happening March 29, 30 & 31st in Globe at 2 Lanes Saloon! 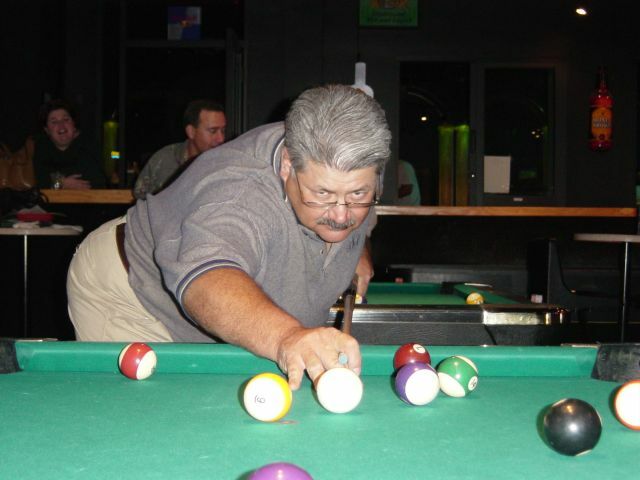 The AZPL's Final State Championships will be held on May 3rd, 4th & 5th at 2 Lanes Saloon in Globe. 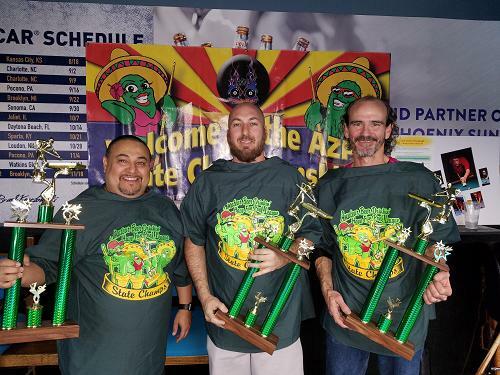 The Fall 2018 AZPL State Champions! Mike Chapa, Robert Berry & Darren Bradford of Ship It! They are your Fall 2018 AZPL State Champs! • 3 Person Teams - no limit on subs! • Matches last about 2 hours - You're done by 10:00 each night! • Every team wins cash! Up to $750 for 1st in division! • $2,500 for 1st Place in the State Championships! • Traveling & In-House Divisions throughout Arizona! • Always accepting new players! 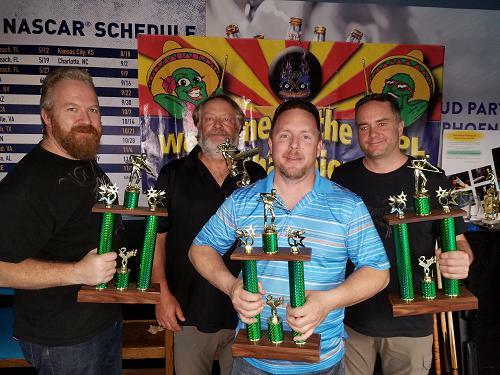 • The most fun pool league in Arizona! 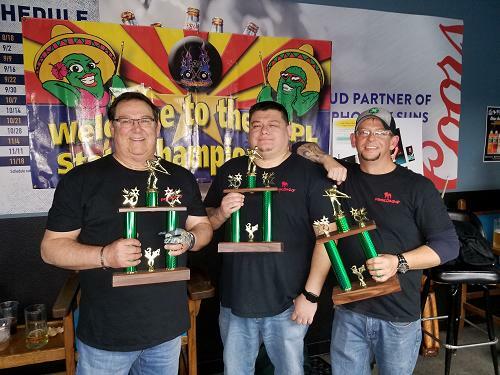 • Sunday Jester's Billiards, Wednesday 2 Lanes Saloon and Flagstaff Traveling divisions sanctioned with ACS! 2nd Place - No Name - Eric McKay, Gary Wimmer, Kip Anderson & Mark Higgins! 3rd Place - Rock Out with Your Chalk Out - Steve Kasper, Jose Cardenas & Matt Miller! Congratulations to our Fall 2018 MVPs & Trophy Winners! Tuesday Globe Traveling Division - Tuesday, January 15th! Thursday Skip & Jan's In-House – Thursday, January 17th – All teams/players meet at 7pm! Sunday Skip & Jan's In-House – Sunday, January 20th - All teams meet at 1pm! If you want to play and don’t have a team let me know and we’ll get you on one! I look forward to shooting with you this season and many more! Thank you! The Official Home of the AZPL! Featuring 8 Diamond 7-footers & 8 9-footers! 3 tables & a full restaurant!